I’ve never written to you before. Therefore, I hope you’ll consider this blog post a sincere substitute for a letter. 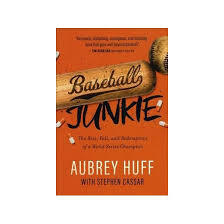 Your new biography Baseball Junkie sounds quite courageous, helping many readers about to take a wrong turn in life. As someone who’s been writing about correspondence with former players since 2010, I wanted to commend you on your willingness to recognize collectors and fans by mail. In fact, I saw on www.sportscollectors.net that collectors had reported success on 278 of the 486 letters to you they had tracked over the last 15 years. In other words, your .570 signing average is admirable, considering that some fans were writing you at your team addresses. Nonetheless, potential readers who collect might hesitate to read your life story, considering that getting an autographed copy by mail might be iffy. Jim Campanis was famed as a “can’t miss” TTM autographer years before his memoir came out. When Born into Baseball appeared, sharing the news in SASEs that included an autograph seemed natural, even welcomed. Although he’s been autographing books purchased directly from him, Jim’s found ways to boost sales by including autographed photos with a purchase. Thanks again for sharing your heart with so many in the world of baseball. We’ll be watching our mailboxes for more exciting moments from you!